1). 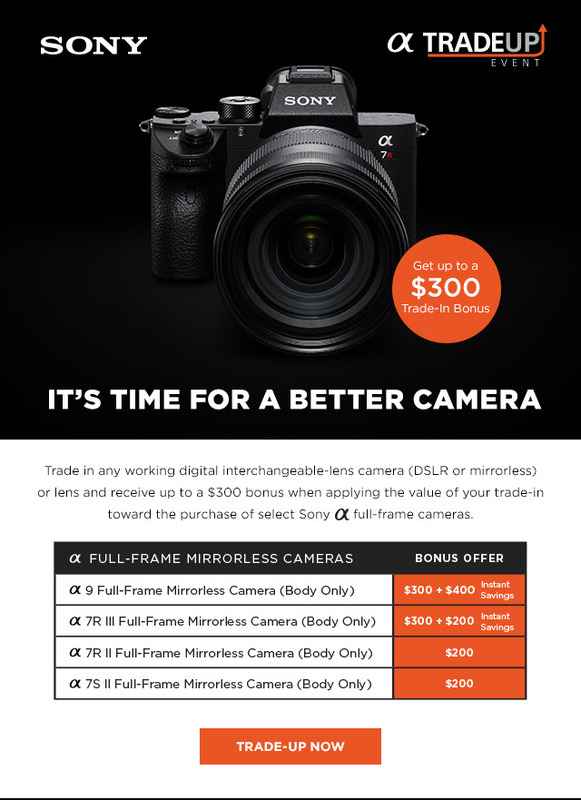 Up to $300 Sony Trade-In Bonus at Adorama, B&H: receive up to a $300 bonus (plus applicable instant savings) when applying the value of your trade-in toward the purchase of select Sony full frame cameras, including Sony a9, a7R III, a7R II and a7S II. 2). Save up to $400 on Sony cameras and lenses at B&H, Adorama. These specials end on September 9th. $400 off on Sony a9 body: $4,098 at Amazon, B&H, Adorama. $400 off on Sony a7R II: $1,998 at Amazon, B&H, Adorama. Sony a7 III body: $1,998 at Amazon, B&H, Adorama.